U.S. Ambassador: On this day, Russia chose protecting a monster over the lives of the Syrian people. Nikki Haley, the U.S. Ambassador to the United Nations, blasted Russia on Tuesday, after it vetoed a U.S.-drafted Security Council resolution that would have set up an investigation into chemical weapons use in Syria following an alleged toxic gas attack in rebel-held Douma. “Month after month, the Assad regime, with full support of Russia and Iran, has strung along this Council. They ignored our calls for a ceasefire. They ignored our calls for political dialogue. They ignored our calls for deliveries of humanitarian aid. They ignored our calls to stop using chemical weapons – weapons that are universally banned from war. 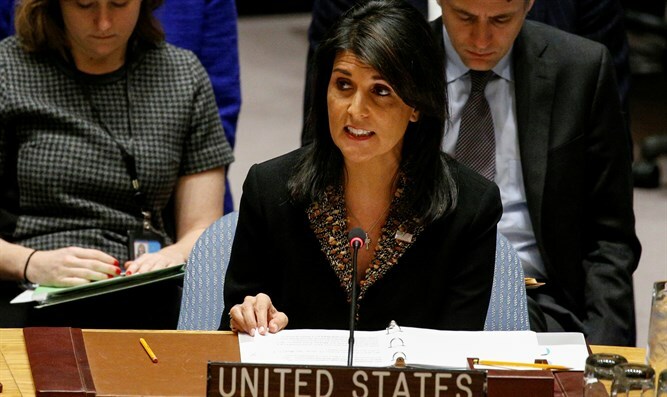 And then, last weekend, the Assad regime forced a moment of reckoning on all of us by gassing people of Douma,” said Haley. “The record will show that today, some countries decided to stand up for truth, accountability, and justice for the Syrian people. Most countries saw the horror that took place in Douma last weekend at the hands of the Assad regime and realized that today was a time for action. The United States supports a new independent, impartial mechanism to make attributions for chemical weapons use in Syria and calls for access for first responders to provide medical help and verification‎ without delay. We hoped that the one-year anniversary of the Khan Sheikhoun attack might be the start of a renewed partnership to combat chemical weapons. But these deadly weapons have been used on Syrian families again. And when the people of Douma, along with the rest of the international community, looked to this Council to act, one country stood in the way. History will record that. History will record that, on this day, Russia chose protecting a monster over the lives of the Syrian people,” she charged. Also on Tuesday, the UN Security Council failed to approve a rival measure put forward by Russia. The Russian draft received only five votes in favor, an insufficient number to pass.